The stated views of President Trump's choice to lead the White House science office break sharply from those of administration officials on climate and energy policy. Picked to lead the Office of Science and Technology Policy, Kelvin Droegemeier is a University of Oklahoma meteorologist who's led state panels and testified many times before Congress, where he spoke favorably on climate research and praised federal programs that the Trump administration proposed slashing (E&E Daily, Aug. 1). In 2013, for instance, Droegemeier told the House Science, Space and Technology Subcommittee on Environment in submitted testimony that climate models reproduced environments hundreds of years in the past and "thus can be useful for determining future environments" and the types of storms that might be expected in the future. "Our understanding of, and ability to predict, high-impact weather will improve climate model representations of storms, precipitation, the radiation budget and even chemical processes," he said. "We are moving toward the day when we will no longer use separate models for weather and climate, and our investments likewise should reflect that trajectory." Droegemeier previously served on an energy and climate team for former Oklahoma Gov. Brad Henry (D) and took part in a 2009 review of NOAA's Climate Prediction Center. That review concluded the center serves as a "national and global asset" for climate assessments. Trump, by contrast, once called climate change a "hoax" perpetrated by China. Some Trump supporters further have questioned the value of modeling of warming temperatures. On multiple occasions, Droegemeier also pushed for increased government spending on science and praised the 2007 National Academies report "Rising Above the Gathering Storm," which called for creation of the Advanced Research Projects Agency-Energy, a program targeted for elimination by Trump. In 2016, Droegemeier warned the Senate Commerce, Science and Transportation Committee that National Science Foundation spending had been flat for three decades. The Trump administration proposed cutting NSF funding in previous budget cycles. "The federal government now invests less of its budget in research and development than at any time since Sputnik was launched. Over the longer term, this will need to change if we want to remain world leaders" in science and technology, Droegemeier said. He recommended a three-pronged approach for boosting U.S. science, including supporting basic research not conducted by the private sector. On OSTP specifically, he endorsed a 2016 report from Rice University co-written by former Clinton science adviser Neal Lane that recommended the OSTP director be part of the president's inner circle and advise closely on issues like climate change. "OSTP is the policy hub of the science and technology research and innovation enterprise, and the importance of its role to our nation is only going to increase as we face ever greater challenges for which science and technology alone can provide answers," Droegemeier said. Droegemeier's background won him support from scientists and lawmakers who sometimes have been on opposite sides of the climate issue. Michael Mann, a climate scientist at Pennsylvania State University who has criticized Trump's climate policies, said Droegemeier is an excellent scientist with "absolutely mainstream views about the atmospheric sciences and climate." "I actually think it's a surprisingly sensible choice for Trump," he said in an email. Katharine Hayhoe, a lead author of the National Climate Assessment and a professor of political science at Texas Tech University, wrote on Twitter she was "delighted and amazed" about the Droegemeier pick. She pointed out he's been a longtime colleague at the South Central Climate Science Center. Droegemeier also won praise from conservative Oklahomans in the Senate, including Sen. Jim Inhofe (R), who also has called global warming a hoax. "From his time as a professor and service on the National Science Board to his leadership as the Vice President for Research at the University of Oklahoma, he has demonstrated a commitment to the scientific process, an appreciation for investing in research and a dedication to advancing technical achievement. I congratulate Kelvin on his nomination and look forward to his swift confirmation," Inhofe said in a statement. Similarly, Sen. James Lankford (R-Okla.) called Droegemeier an incredibly capable researcher and a highly qualified scientist. "The nomination process is long and difficult, but I am proud that a fellow Oklahoman has stepped up to help lead our nation at this time," he said. Rep. Eddie Bernice Johnson (D-Texas), ranking member on the House Science, Space and Technology Committee, noted Droegemeier previously was vice chairman of the National Science Board and founded a National Science Foundation center focused on predicting extreme storms. "I hope that the Administration will heed his advice. Dr. Droegemeier knows how important our commitment to robust R&D and innovation funding is," she said. 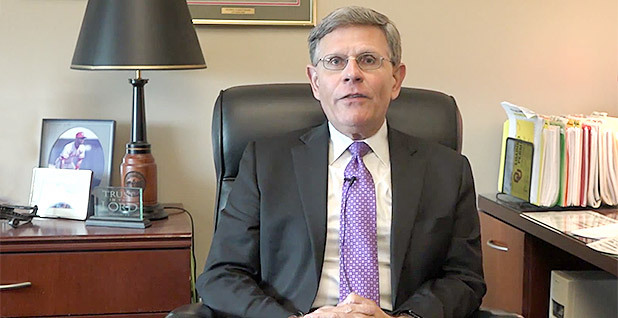 If Droegemeier is confirmed, a key question could be whether Trump gives him a second title of "assistant to the president" and makes him part of the inner White House circle. Presidents Obama, Clinton and George H.W. Bush gave the OSTP director such a dual role, but it's unclear whether Trump has similar intentions. If Trump doesn't make the OSTP director a simultaneous White House science adviser, it would place the position in a silo with likely less influence over day-to-day presidential decisions. Obama science adviser John Holdren, for instance, played a central role in crafting the federal budget and directing the White House response to public health crises and international climate discussions. In the past two years, OSTP cut its staff in half from the peak of the Obama administration and emphasized issues such as artificial intelligence and space exploration. An administration official today offered no commitment on whether Droegemeier would have a second title if confirmed. "We're going to focus on getting him through confirmation at the moment," the official said.